New MUV 3D front fixing bracket for use with the Knape and Vogt MUV+ series concealed undermount drawer slides. 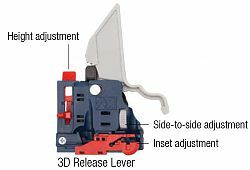 3D Adjustment features: Up/Down Height, Side-to-Side and Inset Adjustment. +3/32" In/Out adjustment for inset drawer applications.